All our sparkling wines are single-estate grown, produced and bottled; using the traditional ‘champagne-method’ of secondary ‘in-bottle’ fermentation to develop their character, complexity and aroma coupled with a fine, delicate and persistent mousse. Hand-picked, batch-disgorged and carefully blended and dosaged, we aim to produce true ‘terroir’ wines – reflective of the nuances of vineyard, variety and vintage. enabling everyone to learn, enjoy and understand more about the complex and fascinating process of producing top quality bottle fermented sparkling wines, right here, in Sussex. This “white of whites” is made from selected hand-picked Chardonnay grapes using the highest quality cuvée to create a sparkling wine which is all about elegance, finesse and subtle complexity. The beautiful rose gold of our Blanc de Noirs comes from the gentle whole bunch pressing of our Pinot Noir grapes. Coupled with extended on-lees aging this has created a rich, smooth and complex sparkling wine. Made from gently crushed grapes this is a rose with real Pinot Noir expression – vibrant deep pink and vivid red fruit. Shorter on-lees aging and low levels of dosage ensure we retain the fresh fruit character of the style. 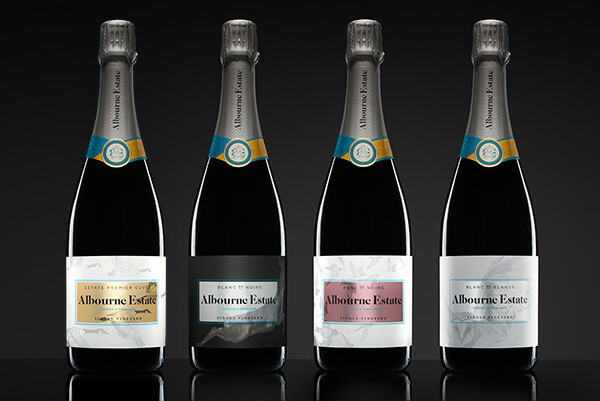 A real contrast to our Blanc de Noirs. Our signature premium blend using the three classic champagne varieties plus Pinot Blanc and Pinot Gris to create a complex, refined and extremely delicious sparkling wine with a firm back bone of acidity.